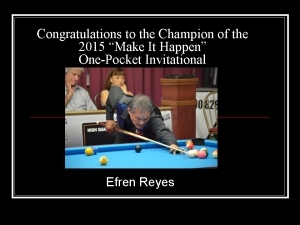 Efren “Bata” Reyes, unquestionably the greatest pool player of all-time, wove his magic once again to win the prestigious Accu-Stats ‘Make It Happen” One Pocket Invitational last weekend at Sandcastle Billiards in New Jersey. Three One Pocket legends led by Reyes and three future stars of the game did battle in an intriguing contest with four of the players chosen based on known ability over their careers according to Accu Stats. The two remaining spots were filled by up and coming Justin Hall who has had several high finishes in One Pocket tournaments in recent years and newcomer to the big stage Danny Smith who had a significant challenge match win against Darren Appleton. The format was a simple race to three round robin with the players with the two best records advancing to the finals. Accu Stats reported that there were a lot of hill-hill matches which was expected in a field of true champions of the game. The round robin ended in dramatic fashion with Reyes and Van Boening who both had 3-1 records facing off with the winner advancing to the finals to face Danny Smith who had a stellar performance to take the top spot with a 4-1 record. The Reyes-Van Boening match was a classic between a legendary figure and a dazzling upstart that went down the wire. The report from the venue said that with the sore tied at 2-2 the game went into a classic one pocket battle mode with all the balls being pushed up the table and the game lasting more than 30 minutes. But Reyes, as he has done so many times in his illustrious career eventually banked on magical moments to win the game to set up a mouth-watering clash between youth and experience. His game in full flow Reyes rose to the challenge and won handily 3-1 to claim the title and to “Make it Happen” in his own inimitable style.